This one seems obvious, right? Many marriage records list the maiden name of the bride. Some even contain the names of the bride’s parents. When searching marriage records, start by searching for the groom’s name, then cross your fingers. You may learn a lot about the family of the bride. 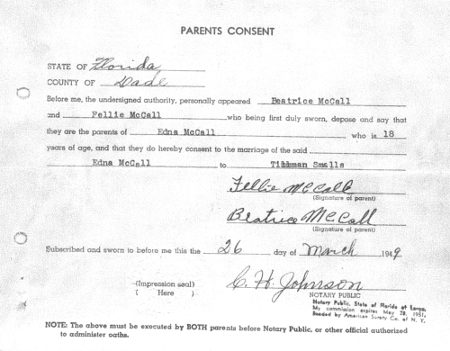 Parental Consent for Edna McCall to Marry Tillman Smalls, 1949. “Florida Marriages, 1830-1993,” database with images, FamilySearch (https://familysearch.org/ark:/61903/3:1:939Z-YXTX-N?cc=1803936&wc=7126-8DY%3A1590063549%2C1590063593 : 14 October 2016), Broward County > Marriage licenses and applications, 1949-1950, book 43-45 > image 162 of 2518; county courthouses, Florida. If you are not able to find a marriage record for a female ancestor, try searching local newspapers for a wedding announcement. Remember that a single event in your ancestor’s life may produce multiple records. Wedding Announcement, Marriage of J.L. Pope and Josephine Smith, 1896. The gazette. (Raleigh, N.C.), March 06, 1897, Image 2. Image provided by University of North Carolina at Chapel Hill Library, Chapel Hill, NC. Persistent link: http://chroniclingamerica.loc.gov/lccn/sn83027097/1897-03-06/ed-1/seq-2/. Obituaries for your female ancestor or other members of her family may include your ancestor’s maiden name. Obituaries for your ancestor’s children may also reveal the maiden name you are seeking. In the example below, we learn that Elizabeth Murphy was the daughter of Jobe and Vicey Washington. 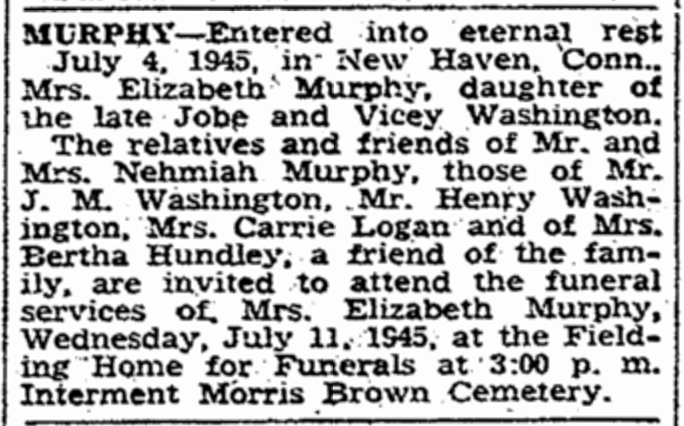 Obituary for Elizabeth Murphy, 1945. Obituary, Elizabeth Murphy, Charleston Evening Post, Tuesday, July 10, 1945, p. 13. Is there a member of your family who keeps the funeral programs for your family? Consult that family member immediately! Funeral programs can reveal a wealth of information about your family members. Often the simple step of gathering your family’s funeral programs can forge major inroads in your family research. 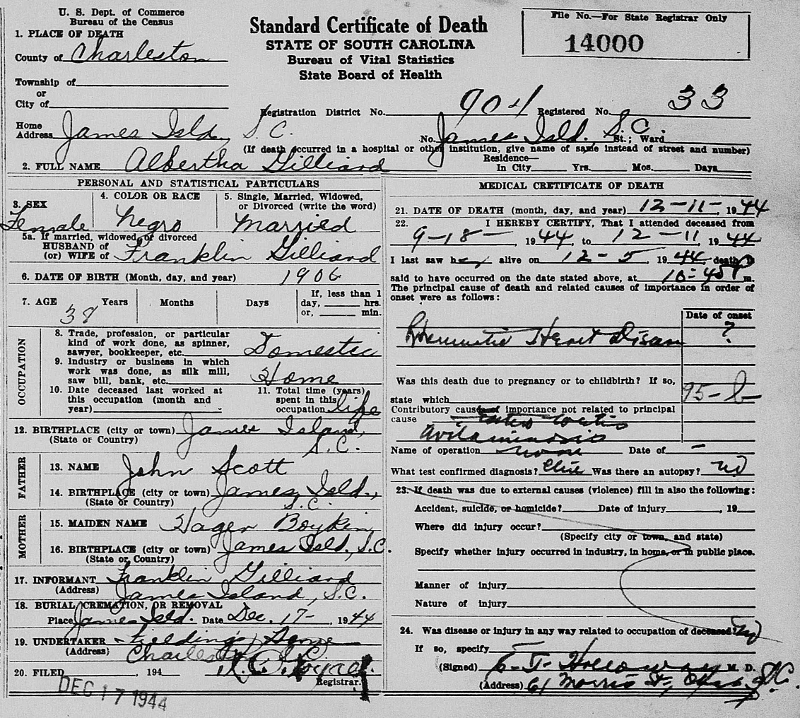 Death records sometimes contain the names of parents. In the example below, Albertha Gilliard’s death certificate states that her parents were John Scott and Hager Boykin. From this record, we not only learn Albertha Gilliard’s maiden name, but that of her mother as well. Death Certificate, Albertha Gilliard, 1944. “South Carolina Deaths, 1915-1965,” database with images, FamilySearch (https://familysearch.org/ark:/61903/1:1:FGB3-3W9 : 18 April 2016), Albertha Gilliard, 11 Dec 1944; citing , Gilliard, Albertha, 1944, Department of Archives and History, State Records Center, Columbia; FHL microfilm 1,943,940. In the example below, we see Susan Jenkins, widowed, in the household of her daughter Janie Martin in the 1940 US Census. Further research may corroborate the suggestion that Janie’s maiden name was Jenkins. Widowed Mother Susan Jenkins in Household of Janie Martin, 1940 US Census. Ancestry.com. 1940 United States Federal Census [database on-line]. Provo, UT, USA: Ancestry.com Operations, Inc., 2012. Year: 1940; Census Place: Blake, Colleton, South Carolina; Roll: T627_3801; Page: 11B; Enumeration District: 15-4. Original data: United States of America, Bureau of the Census. Sixteenth Census of the United States, 1940. Washington, D.C.: National Archives and Records Administration, 1940. T627, 4,643 rolls. If you are a member of Ancesty.com, you can search the database “U.S., Social Security Applications and Claims Index, 1936-2007.” In the following example, we see Annie Green’s parents listed as Carolina Fields and Chitta Brown. Annie Fields Green in the U.S., Social Security Applications and Claims Index, 1936-2007. 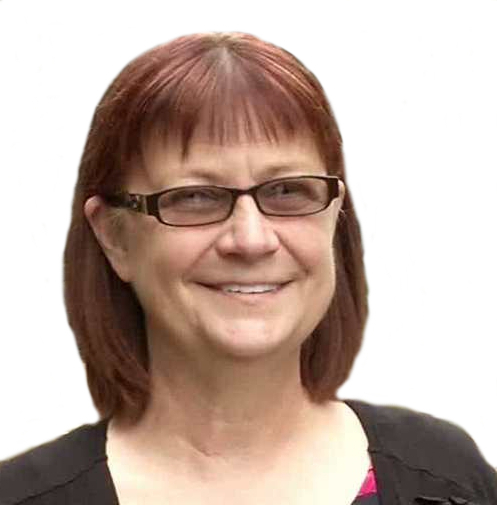 These are just a few tips for finding maiden names. Do you have a tip to share as well? Please share in the comments section below!